Soon we’ll be seeing many industries running their business operations on the blockchain. 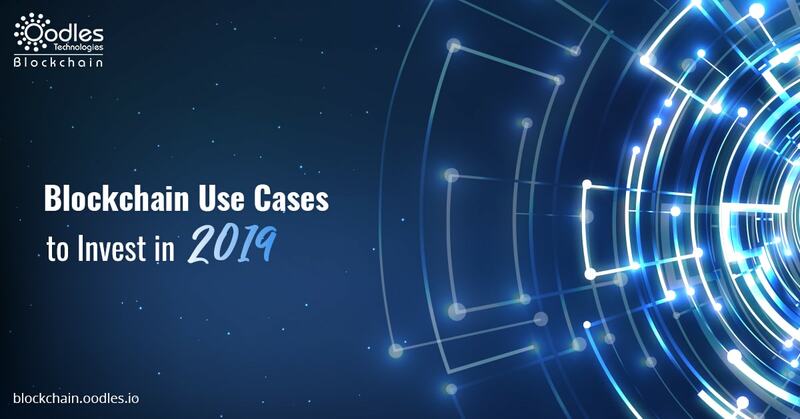 So, here’s a list of some of the most influential blockchain use cases in 2019 that are worth consideration for business enthusiasts. The world has shaped quickly. Along with it, the technology has expanded manifold. However, the issues related to the cross-border remittances are still the same, to some extent. If you’ve ever tried to initiate an international money transfer, you may know how complex is it. Developing a Cross-border remittance app based on the blockchain technology can be one of the perfect Fintech blockchain use cases in 2019. It’s a thriving sector where blockchain technology has shown immense potential. Many blockchain platforms like Ripple are providing faster cross-border payments solutions cost-effectively. The market for cross-border payments is vast and can fit in many big players for each country. A relatively new Fintech idea or startup in the blockchain sphere can prove to quite beneficial for every venture capital funding company in the world. For instance, to start with, you can enable cross-border money transfer between 2 countries. Then, after perfecting the platform, you can expand to numerous countries and initiate required tie-ups. Effective supply chain management is one of the most critical sections in any industry that uses even the smallest form of the supply chain. The surprising fact is that even after so much revolution in many industries, especially in their business operations, the legacy industry has not seen any significant disruption in recent years. The industry is in dire need of reformation. There are many areas within the supply chain where there’s a need to increase transparency, accountability, and traceability. The answers to all these questions lie in the inherent “distributed ledger technology” the concept on which blockchain works. Using DLT solutions, supply chain companies can address these issues seamlessly. Using blockchain based supply chain solutions, we can bring in a robust provenance in the supply chain. With it, we can trace back any mistake within a process to its origin instantly and correct it accordingly. Indeed, a decentralized SCM system can make up for one of the best blockchain use cases in 2019. The entry of the blockchain has given birth to many new phenomena in recent years. Crowdfunding is another idea that has become quite common due to blockchain and cryptocurrency development. New projects and startups have started to resort to the public for investment instead of following the standard VC method of funding. It because a decentralized crypto-based crowdfunding platform offers many merits over the traditional one. Running on a blockchain, you can execute a consensus method to assess which project will be appealing to the masses. The same result can also help bring in the group effect to the entire funding mechanism. Thus, bolstering projects in reaching their funding aims quickly. Also, a crypto-based payment solution can also be used as an excellent revenue channel using which you can launch and disperse your own crypto tokens. So, decentralized crowdfunding can also be one of high ROI blockchain use cases in 2019. A decentralized multi-vendor E-commerce platform can become a disruptive idea to start the year in 2019. E-commerce has always been at the core of the internet which has gone through numerous effective changes. However, it also has some issues like transparency, discriminative pricing, intermediary, etc. which are stopping its widespread adoption. Therefore, one of the most significant transformation this sphere is looking for is a decentralized model. A decentralized E-commerce market can connect the vendors to the buyers along with removing the work of any middleman. Subsequently, products can be prices relatively low. For attracting a myriad of the audience toward your marketplace, a robust provenance can be established on products. It will allow your customers to check the origin and the journey of the product the recently bought or about to purchase. In addition, you can also employ a cryptocurrency based payment solutions on your E-commerce platform. This way vendors can directly receive payment in their wallet sent by the customer. For ensuring the security and smooth flow of payments, you can also put in a strict escrow smart contract in place. It can be one of the most alluring blockchain use cases in 2019 for making an investment. As it will not only allow to run a decentralized E-commerce platform but would also enable payments in crypto tokens. Thus, democratizing the market and reducing the use of fiat currency, the two factors that the whole world is trying to embrace. It’s the most profitable business of all in the blockchain landscape. Why we are calling it ” decentralized?” It’s because you can get your cryptocurrency exchange platform developed and run it without much hassle (unlike centralized exchange). By having a crypto exchange software, you are no more required to worry about money draining server fees, as the whole exchange system will run on clients’ browsers once loaded. Also, there’s no need to worry about the security as the cryptocurrencies get exchanged directly between customer’s wallets. In a nutshell, nothing gets stored on your servers. So, it’s another vertical of blockchain sphere that promises to become one of the top blockchain use cases in 2019. How To Get Success In Crypto Exchange Business Startup?
. Similarly, the blockchain is ready to enter the gaming for a radical change again. As a matter of fact, it was the gaming sector that first launched virtual coins even before the cryptocurrency rage. The market and interest size for gaming in the digital space is growing parallel with the internet. With blockchain based gaming system, one can develop streams like “crypto mining” on the users’ computers when the game is being played. With the media tokens, the entire web content sharing system is getting tokenized. From picture sharing sites, blog to any media platforms, the tokenization idea is gaining significant traction. Indeed, it’s the perfect time to set out a YouTube-like video sharing platform that will run on a blockchain. After the launch of decentralized video sharing system, the recurring infrastructure fees would get reduced. Such a gaming ecosystem can be made using the blockchain platform like Steem. It will reward miners to lend their computing resources for storing the videos. And, a part of the could be used to provide users with incentives to upload videos. Also, you can incentivize the viewers to make them come back again on the platform frequently. Of all these blockchain use cases in 2019, a decentralized content sharing platform could completely change your fortune. Unquestionably, the DLTs are going to give the “sever” industry a stiff competition. A decentralized Dropbox platform is one of the innovative blockchain use cases in 2019. With such a business model in place, you can expect a big miner’s crowd ready for hosting files. Further, for the resources they share, you can reward them with cryptos. You can gather many users to use your Decentralized file storage system as the fee will be comparatively low than other services due to the complete cut of server fees. By providing industry-grade security and encryption arrangements, you can make your blockchain based file storage system a big hit. Experts predict that blockchain is now not only a trend but its the new internet. The advantages presented by this distributed ledger technology are in abundance. Most importantly, every business category in the world can utilize its perks. Significantly, some of the most complex issues in the technology space can be fixed using the blockchain based solutions. From security, effective governance, accountability to collective wisdom, transparency, traceability, etc. the blockchain has an answer to everything. So, why not invest in one of these blockchain use cases in 2019. If any of these blockchain use cases triggered a query, and you’re looking for detailed information, directly connect with us. We’ll help in the best way possible.